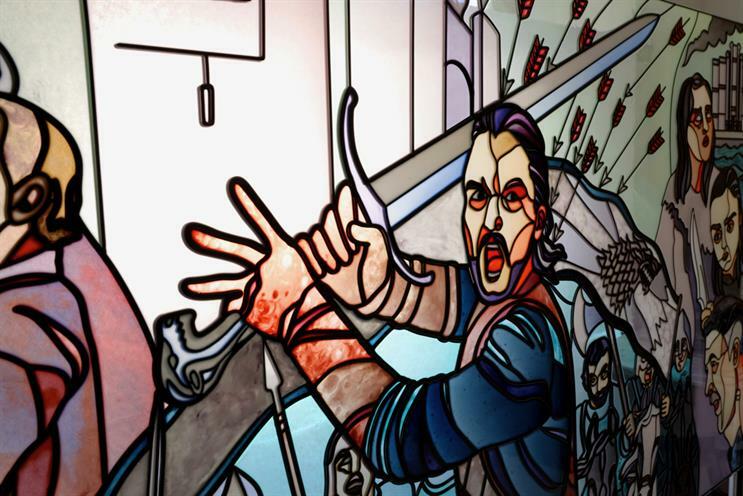 Tourism Ireland is launching an experiential campaign around the latest and final season of Game of Thrones with a stained glass "fan trail" in Belfast, where much of the series was filmed. Publicis London has created a "Glass of thrones" series of installations, the first of which will be unveiled today (15 April) in the grounds of Belfast City Hall. There will be six in total. Creatively inspired by fan search data, the windows will depict key moments from the show, including battles, dragons, white walkers and matrimonial massacres. The installations will appear in locations around the city along a path for fans to follow. HBO's final season of Game of Thrones kicked off today (at 2am in the UK on Sky Atlantic). Much of the series has been filmed and produced in Northern Ireland over the past decade. The "Glass of thrones" activation is a collaboration between Tourism Ireland, Tourism Northern Ireland and HBO. Promotional activity will be aimed at fans in 10 markets: Australia, Canada, France, Germany, Italy, the Netherlands, Scandinavia, Spain, the UK and the US. The first "Glass of thrones" will focus on House Stark, one of the series' dynasties, based in the harsh northern regions of fictional Westeros. Other houses that will be represented include Lannister and Targaryen. Fans will be encouraged to share their images on social media. A new window will be unveiled each week, eventually forming a 1.8-mile trail that concludes at Titanic Studios, where much of the show was produced. For those unable to visit Northern Ireland, Ireland.com will feature an app allowing people to upload photographs of themselves against a digital facsimile of each window. Tourism Ireland will also distribute short films and images across social media including Facebook, Instagram and YouTube, while influencers will be invited to Northern Ireland to see the installations. The campaign was created by Josh Norbury at Publicis London, with media handled by OMD London. Dave Monk, Publicis London’s executive creative director, said: "Stained glass windows are the posters of history. So what better way to celebrate the legacy of Game of Thrones, and the country that helped make it, than building a series of brand new tourist attractions to live both permanently in the heart of Belfast’s old industrial glassmaking district and in the world’s Instagram feeds for years to come?"